Lilies and Elephants: How Often Do You Ask For Permission? 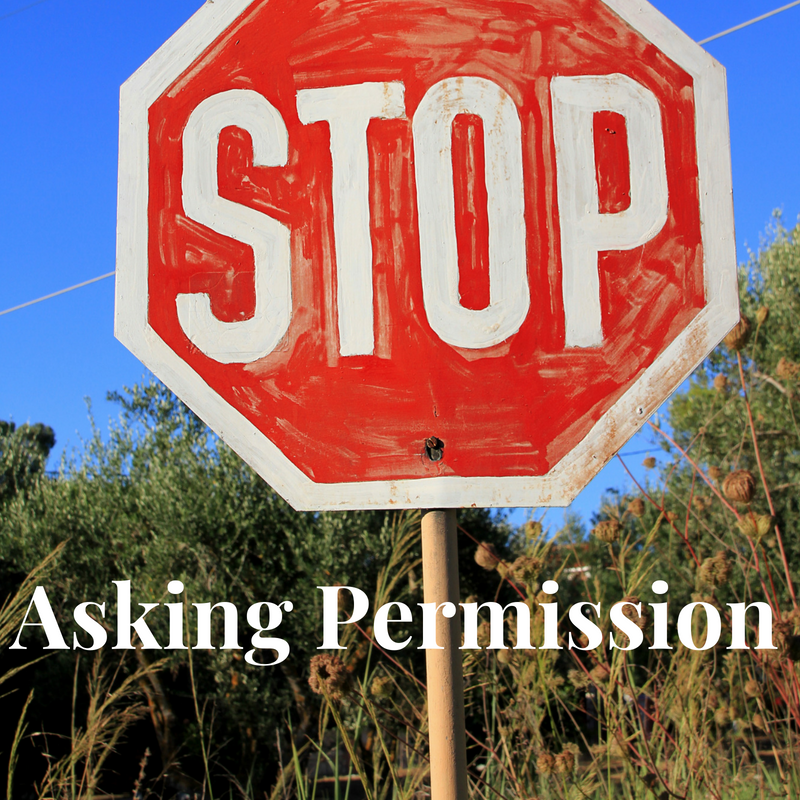 How Often Do You Ask For Permission? "Do you mind if I use the bathroom before I start on xyz?" Yes, I've asked probably every person regularly in my life, at one point or another, if they mind if I do essential things like use the bathroom. "Is it OK if I wear this?" Not to anything specific that would impact the person/people, to clarify. Just to make sure they're OK with it, I guess. Because I'm always afraid I've chosen wrong somehow. If I'm not asking people's permission, I'm asking their opinion, in almost a permission-y way. I'll be sending an email about something and read it out loud to them to make sure... that I know how to write an email? I don't even know why. I was the VP of communications for a big organization. I have a Master's in Marketing. I am a published writer. I know how to write and communicate. There's zero point in my painstakingly seeking approval from others for a basic email. But I'm so sure I somehow got it wrong that I ask, "just in case". I ask people's opinions on how to cook something as I'm staring at a recipe because I don't trust myself to even find a good recipe. I ask how to wash something as I'm staring at the laundry label, because I doubt myself. You get the picture. I'm always certain someone else knows better than me, in everything. I'm a chronic permission asker. When you battle with depression, your brain often lies to you. It tells you that you're not good enough, that you don't know anything, that you're not capable. It tells you that if someone claims to know better, you should just believe them because really, what do you know? After all, your brain makes you feel anxious or depressed "for no reason." (Note: this isn't true, the reason is an illness, but it's how depression makes you feel.) You've been convinced not to trust your views, your thought process. Because you often see things differently, more emotionally, it's easy for depression to convince you that you aren't logical and therefore can't possibly come to the right conclusion. Because of these lies, and the chronic low self-esteem and self-worth that often result, its easier to fall into permission and opinion asking as a default, instead of trusting ourselves. Let me step back and take a moment to further clarify, I'm not asking about permission to do something that actually affects someone else. Of course, I'm not going to spend tons of money out of our joint banking account without asking my husband. I'm not going to make plans that include a friend without checking with them, or make plans on a Tuesday that don't include my friend, if we have a standing Tuesday friend-date together. I'm not saying we should live our lives in a bubble, thinking only of ourselves. Far from it. Considering others when it could/does affect them is just common courtesy. I'm talking about things that, in all reality, don't affect another person's time, money, plans, efforts, etc. I'm talking about things that don't take anything away from anyone else. 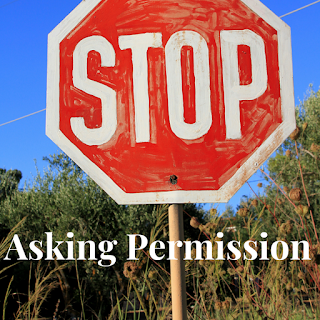 Most of the time, when I ask permission, it's not something that I'm asking out of consideration. I'm simply asking because it's become automatic - I never want to upset anyone or do the "wrong" thing, so I'm overly cautious about making sure everyone is OK with everything. And I don't trust my brain to make this type of decision. The problem with being a chronic permission asker is that it further feeds the cycle of low self-esteem and self worth. The more you ask permission and opinion for these tiny mundane things, the tougher it is to do anything without others' approval. And if you do, and there's any disagreement/criticism/critique/it doesn't go right, it makes you feel like you should have just asked and listened to them in the first place. It becomes increasingly difficult to trust yourself, your thoughts, your opinions. Eventually, you become afraid to think for yourself, because surely, you'll be wrong. Might as well just by-step the "middleman" and go straight to the source - someone else. One day, you wake up and realize that you don't recognize your own thoughts or ideas. You don't recognize yourself. You're now this being made up of everyone else's thoughts and opinions. You're literally afraid to do basic, every day things, make simple decisions - even ones that you previously would have been confident in - without someone else's approval and permission, because your brain is so sure you'll do it wrong. So stop. Stop asking permission for the things that don't matter. Nobody's worse off if you wear one shirt over another (assuming it's not their shirt you're choosing to wear). If you use the bathroom now or in 10 minutes. If you feed the dog or do the laundry or some other basic task now or in a half hour. Nobody's worse off if your wording in that email isn't exactly as they would have worded it (assuming you aren't strewing in profanities or inappropriateness or speaking on behalf of someone else without their consent... you get the point). If follow a recipe and it's not perfect ... well, it's not perfect. I'll eat something imperfect or order a pizza. It's just not that big of a deal, and it's not worth lowering your already low self-esteem by feeling like you can't trust yourself on these tiniest decisions and processes. In constantly allowing others' permission or approval to determine your actions, thoughts, words, you're giving them control. And I don't mean control we all deserve - i.e. having a say in something that directly will impact us - but control they have no business having. As an adult human being, nobody but you should have control over your bathroom usage or which pair of jeans you wear or how you style your hair or anything else. It becomes a slippery slope - one that's dangerous for your self-esteem and self-worth. So give yourself permission. I know this isn't easy. Depression and anxiety don't want to let you do this. But it's so important. Listen to yourself. After all, you know you better than anyone else. And you're way more capable and able than your illness wants you to believe.